I don’t sell Echinopsis, but I’m glad to try to direct you to some of the places from which I’ve obtained mine. If you live in Arizona or California in the US, you may be able to visit vendors in person. Everywhere else in the US, Europe and elsewhere, you’re going to have to obtain your Echinopsis online/by mail. (1) Don’t buy seeds unless you’re willing to wait for 5 or more years to see flowers. These plants grow very very slowly, especially in early years. (2) Always be sure you understand how old/large the plant you will receive will be. Typically images show on websites are of the overall species/hybrid, not the plant you will receive. Avoid being surprised by making a specific inquiry about what you will get vs. what is depicted on the website. (3) Always try to buy the most mature/largest plant your budget allows. The older/larger a plant is, the more likely it will not only flower, but flower profusely. As a general rule, plants need to be at least 3 years old and 3″/8cm or taller before they will bloom. In my experience, you are going to pay $20+ and also shipping for mature plants. A price below $20 means the plant is likely to be a small pup. If someone offers you a pup, there’s no harm in asking if they have a larger plant available and what the price for it would be. (4) You are going to need to buy from a vendor in your country or region. Very few US vendors will ship overseas due to all the extra paperwork/headaches required to send live plants internationally. Similarly, the excellent hybridizers in Germany, the UK and elsewhere are not going to ship to the US. Please note that Matt’s Landscape listed below is an exception to this rule. They will ship from California to anywhere in the world that it’s possible to do so and are familiar with the rules and paperwork requirements. Perhaps the easiest way to obtain Echinopsis is to search this term on Ebay. This is a great solution whether you live in the US or Europe. I’ve always received good plants this way … as long as I took the time to make sure I understood what I would be receiving. Please note you will almost always find Echinopsis seeds for sale on Ebay. As I mentioned above, unless you are say 12 years old and are willing to wait a good portion of the remainder of your life to see flowers, I discourage you from purchasing seeds. Mattslandscape is, in my experience, the single best source for a wide selection of Echinopsis and mature/large Echinopsis as well. Matt also has a great selection of Trichocereus, which are now formerly considered Echinopsis. As noted above, Matt will also ship from the US to anywhere in the world it is possible to do so. The best way to get Echinopsis from Matt’s Landscape is to first review the extensive listings of Echinopsis and Trichocereus you will find at www.mattslandscape.com and make a list of what you like. Once you have your list together, call Mattslandscape at 949-355-6137 to determine whether they have the specific plant types you would like in stock and, if so, at what sizes and what prices. Email contact info is at Epicacti.com (the sister company of Mattslandscape). Please note that you can find many offerings from Matts Landscape on Ebay. On Ebay they use the name SandysGarden1188. So when you see a SandyGarden1188 offering, it’s really the same as Matt’s Landscape. Another outfit with a pretty good selection of Echinopsis and other types of cactus available online and good service to boot. B&B is a great source for Trichocereus hybrids. They don’t have an online store, but you can call them and order. B&B is located in Tucson, AZ. Their number is 520.721.4687. They’re open 8:30-4:30 AZ time Tuesday-Saturday, but closed Sundays and Mondays. Visit the following page to see images of some of the Trichocereus B&B sells. You’ll also find a link to an excellent article describing Trichocereus (which used to be a separate type of cactus but now is considered a subtype of Echinopsis) and showing additional images of B&B offerings. Bob Schick is one of the most famous of Echinopsis hybridizers … responsible for creating over 125 hybrids. Bob developed his collection at his home in Southern California. When his work finally outgrew his home and his time, he arranged for the amazing Huntington Botanical Gardens in San Marino, CA to take over his work. The Huntington Botanical Gardens not only maintain Bob’s hybrids, they even sell small pups of virtually all of his hybrids over the internet. Please note that you can only purchase Echinopsis from the Huntington Gardens by email as explained at the link above. You cannot purchase plants in person when you visit the overall gardens. Please also note that it typically takes 6-8 weeks to receive your order and the plants you will receive from the Huntington are small pups at least a year from flowering. Again, the Huntington is the single best resource for obtaining the full range of Schick Echinopsis hybrids. We just need to have reasonable expectations as this is a service they are providing to interested individuals like you and me, not a core part of their organization’s purpose. John Trager is the Curator of Desert Collections for the Huntington Botanical Gardens. His 30 years of work show in every aspect of the Huntington’s simply mind-blowing dessert gardens and it’s all the more amazing that he takes a personal hand in filling orders for Schick hybrids. 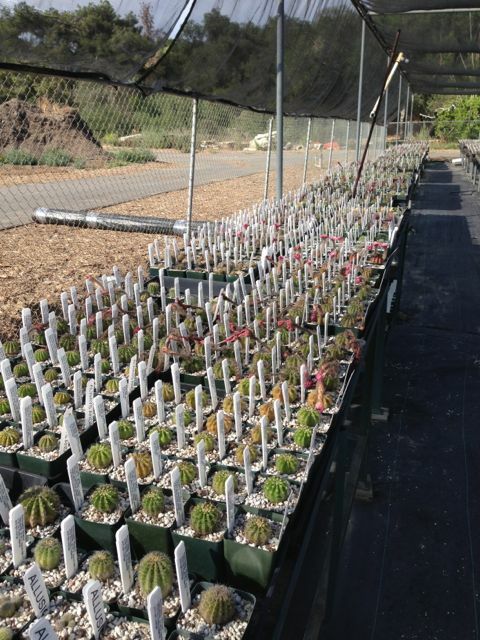 Here are but a few of the Schick Echinopsis hybrids being raised by the staff of the Huntington Botanical Garden. If you’re ever in Southern California, be sure to visit the Huntington Library, Art Collection and Botanical Gardens in San Marino. All of the gardens are sensational and, again, the dessert gardens are worth the trip on their own. San Marino is ~20 minutes from downtown LA, just southeast of Pasadena.